In the city of Chicago, there is a 20-year life expectancy gap between communities of color and predominantly white communities. If you live in a neighborhood like Pilsen, statistically speaking, you’re likely to not live as long as someone who lives in Oak Park. 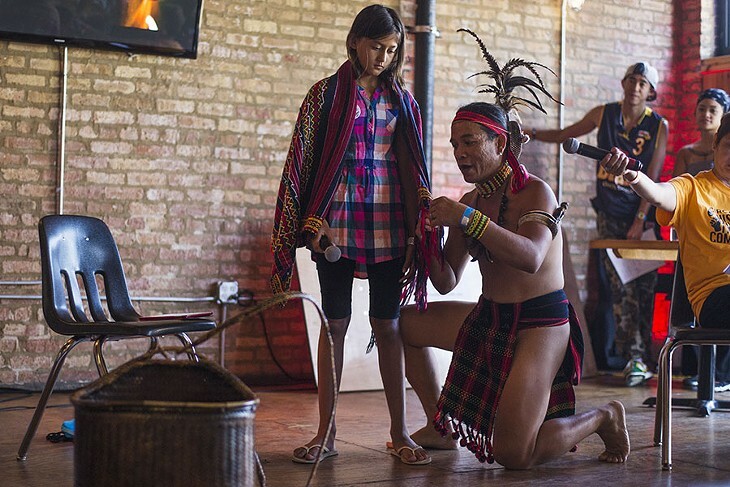 Pilsen native Tanya Lozano has set out to combat this gap through her nonprofit, Youth Service Corps, and her fitness and dance studio, Healthy Hood. So while the documentary includes interviews with craft beer luminaries like Sam Calagione (Dogfish Head), Garrett Oliver (Brooklyn Brewing), and Jim Koch (Boston Beer Company), it's really a story of the beer world, not just the craft beer one. It's coming to the Music Box on Tuesday, November 20, for a one-night screening that includes a Q&A with Tirola and Reed, along with local brewer and author Randy Mosher and Ray Daniels, founder and director of the Cicerone Certification Program, who both appear in the film. I talked to Tirola and Daniels (separately) about the film and the Cicerone Certification Program, which, like Daniels, is based in Chicago. The Reader's archive is vast and varied, going back to 1971. Every week in Archive Dive, we'll dig through and bring up some finds. Sure, your aunt may say she made that Thanksgiving pumpkin pie all on her own, but how much does she know about the people who picked and packed the pumpkins before the can of pie filling entered her kitchen? In the 2006 Reader article "Hecho en Illinois," Linda Lutton and Catrin Einhorn explored Morton, Illinois, which at the time produced as much as 90 percent of all canned pumpkin consumed in the United States. And the majority of those who made it possible traveled from a small town in Michoacan, Mexico. The Arabic word for generosity, "كرم," or "karam," is also the name of a newish Albany Park Middle Eastern spot in the strip-mall home of the equally wonderful Sahar Meat Market and Jaafer Sweets—all at the northern end of a string of historically treasured Kedzie Avenue Levantine and Persian businesses. But while the Persian Noon-O-Kabob and Kabobi Grill are thriving, Arabic spots like Salam and Semiramis have had ups and downs over the years. Long gone is the golden age of the late, great Shawerma King, so when something new opens there's cause for optimism. Karam Grill opened last spring just in time for Ramadan, when they threw down an epic $19.99 iftar buffet, which I won't sleep on again. Taco Scholar Titus Ruscitti was the one who first motivated me to get in there, and as with most of the places he champions, his enthusiasm wasn't misplaced. Others have cheered Karam Grill's shawerma, but that's not what got me excited. The plate I was served was in fact a generous pile of shaved beef alongside an enormous portion of rice that absorbed the beefy fluids, with a shockingly fresh tomato-cucumber salad, both of which I attacked with more passion than the protein. The kufta and beef and chicken kebabs on the mixed grill stood up to the heat much better. I've been more impressed with the mezze I've tried than anything else: vegetarian stuffed grape leaves so lemony you'll squint; salty, par-melted squares of fried Nabulsi cheese; extrasmoky, coarsely blended baba ghanoush. Still more compelling is the catering menu, which offers a whole stuffed roasted lamb and less common dishes like mansaf, a Jordanian dish of nutty, yogurt-drenched rice and lamb, and maqluba, an inverted casserole of rice and meat. A few of these may occasionally show up as specials. Otherwise there's always next Ramadan. Don't you hate it when this happens? You hear great things about a new place, but you know it takes time for restaurants to get in the groove, working out the kinks in the kitchen and front of the house. So you wait awhile to give it time to come into its own. Then you go and it either meets, exceeds, or disappoints expectations, but one way or another you're inspired enough to want to tell people about it. And then you find out it's closing. Tikkawala, which is closing Friday, is a fast-casual West Loop Indian restaurant with fine-dining pretensions from a pair of industry vets. "We started off with a real amazing menu," chef Hiran Patel told me when I talked to him earlier this week before filing next week's restaurant review. 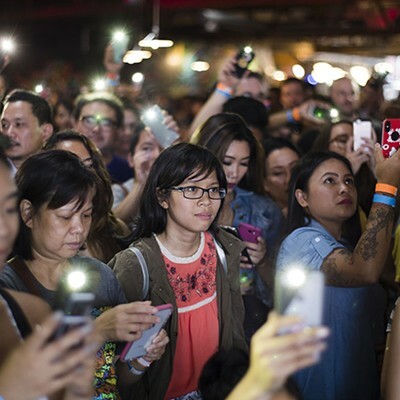 "We hit a grand slam and got a lot of attention. It just didn't make sense in dollars and cents to continue, because everything was from scratch, and we only had four tables and no bar program." Patel, a veteran of Klay Oven Kitchen and Veerasway, along with chef Siran Singh (Roister, Veerasway), opened this tiny counter-service spot in June, by day feeding hot dogs and chicken seekh burgers to the kids from Whitney Young, and by night serving grown-ups (including enthusiastic early-bird food writers) more ambitious things like grilled shrimp with mango-apple salad and grilled lamb chops with Indian-spiced chimichurri and gingered potato puree. Usually I wait about a month before I'll visit a new place, but I clearly slept on Tikkawala too long. I could tell right away something was up. Those dishes were nowhere to be found, and even things like the lauded rogan josh and saag paneer with fresh spinach were missing the cheffy garnishes that reportedlly had gussied these standards up. No chicken seekh burgers either—just a bare-bones lineup up of eight textbook dishes and a handful of sides. I tried them all, and they were all pretty good and fresh, even if somewhat restrained in their spice profiles. That restraint's intentional, according to the chefs, so that at least was on target. But Patel tells me it isn't goodbye, just see you later. Another partner owns the building, so they're going to take some time to refocus and develop a concept that makes financial sense yet won't stifle their creativity. An intriguing five-course "Namaste Italy" dinner set for tonight has also been put off, but anyone who can't stave off a craving for the partners' take on Indian fast-casual can still hit up their two Naansense locations for lamb vindaloo tacos or channa tikka quinoa bowls. Suddenly the 2600 block of West Lawrence, on the west end of Lincoln Square, seems like an international sandwich incubator. Along with longtime banh mi supremacists Nhu Lan Bakery and the cheesesteak church of Monti's around the corner on Rockwell, the new kid on the block is Sweet Pepper Venezuelan Food Bar, a storefront trafficking in the arepa rellena, the stuffed cornmeal wonder of Venezuela. Just work with me. Sweet Pepper is the inspiration of Jose Navea and Andrea Andrade, a young couple formerly of the Andean city of Mérida, in northwestern Venezuela, and it's the latest in an almost unprecedented string of Venezuelan restaurants like Bienmesabe, La Cocinita, Rica Arepa, and 11 Degrees North (RIP Aripo's), all founded by recent arrivals who've escaped the chaos of their native country. We're lucky to have them. It's due to these newcomers that we've become increasingly familiar with classic combos like La Nuestra ("Ours"), stuffed with pabelon, the Venezuelan national dish of shredded beef, black beans, sweet plantains, and cheese; the El Domino, named for its contrasting black beans and crumbled white cheese; and the chicken-salad-and-avocado Reina Pepiada ("Voluptuous Queen"), named in honor of Susana Duijm, winner of the 1955 Miss World pageant. If you're not hip to the classics, Sweet Pepper takes the mystery out of the arepa-stuffing process with a Chipotle-style build-your-own combo system wherein you choose a protein (barbacoa, pulled pork, shredded chicken, avocado-chicken, tuna, tofu), then add cheese, beans, and/or vegetables and a variety of sauces, like the thin guac variant guasacaca, or the sweet and spicy aji pepper relish that the restaurant is named for, a specialty of Mérida. The arepas' crisp outer layer bulges around the ample fillings Andrade and Navea pack into their soft, faintly sweet interiors. They're durable little bassinets, but inevitably there's some fallout, so if you prefer to work with a fork and bowl from the start, you can apply the formula over rice, salad, or plantains. Still, that's denying yourself a singular hand-to-mouth experience. They're frying their own yuca and plantain chips at Sweet Pepper, and bottling a few juices like mango, passion fruit, and papelon, a lemonade gently sweetened with cane and brown sugar that almost tastes like an unfermented tepache. 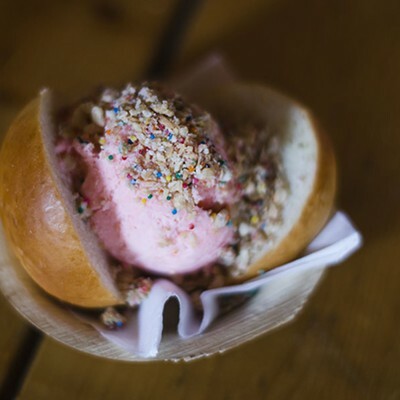 There are a few desserts too, but the folks behind Sweet Pepper are specialists, focusing on a superhero of the sandwich universe, here in the company of its kind. A fun thing I did this summer was don sackcloth and sit outside the Happy Place pop-up exhibition, offering to reveal the exact time and cause of death for each person that exited. I didn't end up in many selfies, but I did my best to reset an appreciation for the malignant horror of the moment. A more genuine Instagram trap opened in the waning days of summer that has me feeling more cheerful. Pretty Cool Ice Cream is a twee Logan Square ice cream parlor from Dana Salls Cree, the ace pastry chef and author of last year's cookbook Hello, My Name Is Ice Cream, whose talents over the years could only be appreciated with reservations at posh spots like Noma, Alinea, Blackbird, Avec, and various other outposts in the One Off Hospitality empire. A few years ago Cree teased the masses with the potential of going retail with her flavored milks, yogurts, and frozen treats at the never realized 1871 Dairy, but until now, her work was a rare indulgence. There's no scooping at Pretty Cool, which traffics strictly in novelty pops that are at once inventive and nostalgic. The variety is dazzling: mustered like soldiers in the frozen display cases, the offerings include chocolate-covered custard bars (caramel-potato chip, coffee-pretzel-toffee); dairy-free "truck pops," unlikely to encourage "Turkey in the Straw" earworms (cherry-pineapple, pink lemonade); vegan "plant pops" (banana-horchata, matcha-mint); kid-size "pony pops" (cookie monster, bubble gum); fruity buttermilk-based bars (roasted nectarine, black raspberry); and lysergically colored party pops coated in vivid magic shell and sprinkles. It's an almost overwhelming selection that almost led me to a panic attack during my first visit, which I staved off on a follow-up with a cooler that I packed with everything from a "MacArthur Park"-worthy green-apple party pop to the very adult Arnold Palmer to the peach-buttermilk bar with its keen fermented tang. This is all set in a kid-friendly Wonkaesque environment with magnetized lettering on the walls and bamboo bleachers like the story room in a children's library. The bubblegum-pink facade also looks in on the kitchen, where you can watch Cree and company in production and R&D modes, which has already led to disruptions like peanut butter-banana-hemp doggy pops and wild huckleberry bars made with Washington State fruit that are likely to keep this happy place's Instagram tags populated all winter long. Pretty Cool Ice Cream, 2353 N. California, 773-697-4140, prettycoolicecream.com. For sale by owner: a big yellow diesel-powered step van. Extras include a Chicago food truck license, a website, several social media accounts with more than 10,000 followers, pierogi-making equipment, training, and access to special recipes for the Polish dumplings. It's not unusual to see a vehicle for sale on Craigslist. But Damian and Jessica Warzecha's ad is different because the husband-and-wife food entrepreneurs are selling their entire Pierogi Wagon business along with the truck—all for the asking price of $25,000. The catch? You have to continue running it as Pierogi Wagon. Nothing else. There's a lot more to the culture than Spam, you know. Rapper and spoken-word artist Ruby Ibarra performs. 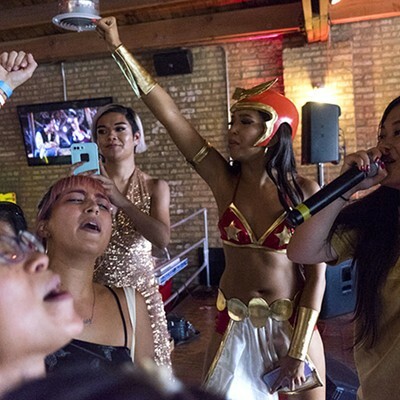 This past weekend, Emporium Logan Square was turned into an ephemeral Filipino neighborhood that featured Filipino-American chefs, artists, dancers, activists, and performers. 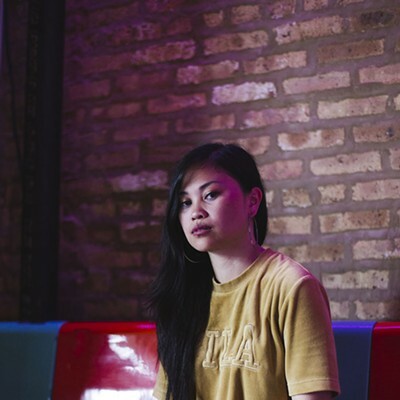 Where other ethnicities have distinct neighborhood identified with them—Chinatown, Greektown, Pilsen and La Villita—"We don’t have our exact community space. . . . We don't have a Filipino town," says Natalia Roxas, a photographer behind the food and culture website Filipino Kitchen. Four years ago "in a drunken spur" Roxas came up with the thought of a Filipino-specific event. 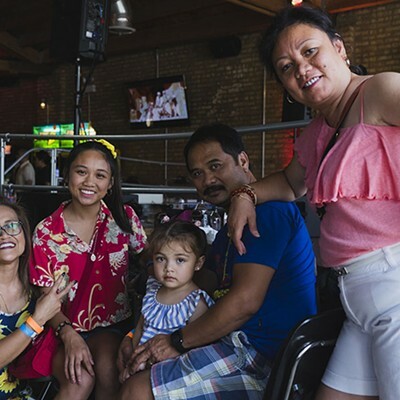 The Kultura Fest blossomed into something bigger as she talked to people in Chicago's Filipino-American community. 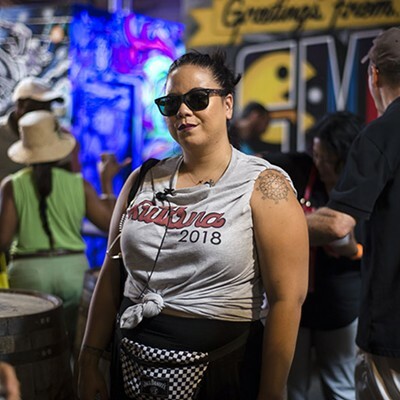 "It's that need of having a community space and coming together to really appreciate and highlight all these people that are hidden in different kitchens and difference scenes," Roxas says. "It feels like our community here is struggling with that." 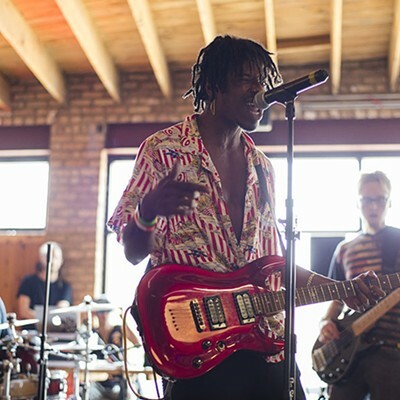 But Sunday's festival drew people from all over the midwest as well as a chef from Portland, Oregon, and artists from the Bay Area. 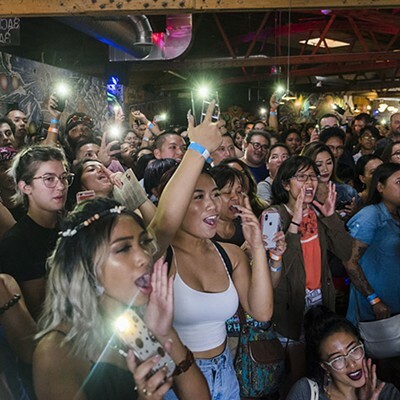 Filipino pride was palpable in the room as Filipino-American artist Ruby Ibarra rapped about the beauty of having brown skin. 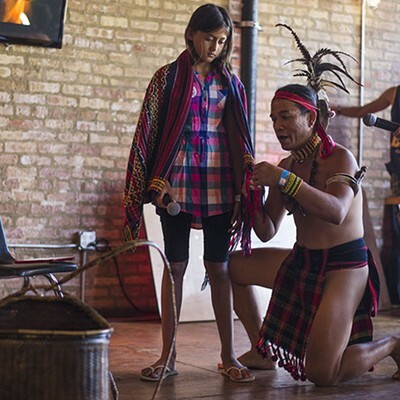 Last Friday I stopped by the Evanston Art & Big Fork Festival to check out Guaclandia, a small portion of the festival being spun as a "fun and immersive avocado experience." That was a bit of an oversell. The entirety of Guaclandia was a school bus emblazoned with letters advertising Wholly Guacamole—a company specializing in flavored guacamole dips—and an avocado-green ball pit (see what they did there) that spilled out the back. The themes and entertainment felt lifted straight from a kindergartener's birthday party, and I imagine the pit was about as sanitary. It took about two minutes to walk through Guaclandia. Featured was a Warhol-style wall of avocado illustrations, a claw-machine arcade game with small avocado-themed prizes, and a nearly blank wall on which guests were prompted to write in chalk what they liked about avocados.